Tested in the world’s most rugged environments, the Husqvarna 572 XP® is ready for demanding work by forestry and tree care professionals. At just 14.5 lbs, the 572 XP® has a better power-to-weight ratio and 12% higher cutting capacity than previous Husqvarna models in the same class. Excellent cooling and heavy-duty filtration maximize reliability, while a smart design accommodates longer guide bars. Thanks to AutoTune™, Air Injection™ and low vibration technology, the 572 XP® empowers you to work all day. Plus, heated handles increase comfort in cold and damp conditions. Get ready to cut faster, longer and better than ever with the 572 XP®. HEATED HANDLES KEEP YOU PRODUCTIVE: Keeps your hands warm for improved comfort and productivity. Maintaining manoeuvrability and control at the highest level also increases safety. HIGHER CUTTING CAPACITY: Engine design offers a wide usable RPM range for peak performance even under heavy loads. 12% higher cutting capacity (compared to previous models in the same cc-range) makes the saw ideal for productive operation – even when using long guide bars. EXCELLENT COOLING CAPACITY FOR A LONGER ENGINE LIFE: Our cooling system is optimised in every detail to give you a reliable chainsaw for any situation. EQUIPPED WITH STATE-OF-THE-ART FILTRATION SYSTEM: 572 XP® carries – as standard – a large surface heavy duty filter for longer and better filtration. The filter has a larger filtration area compared to previous generation. 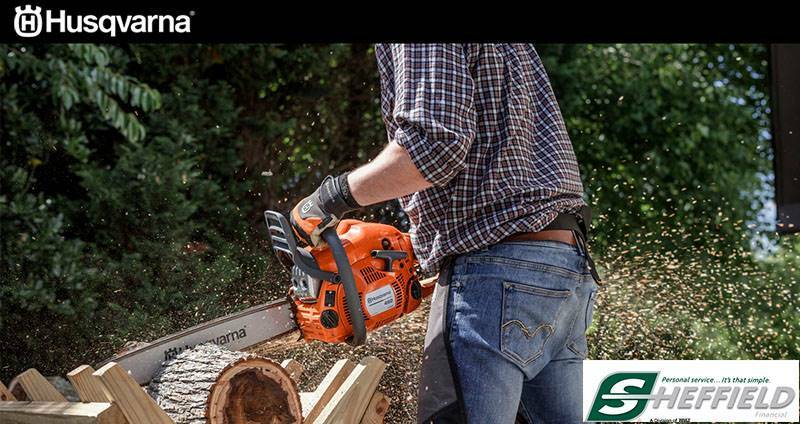 Providing a chainsaw with a healthier engine optimised for long working hours. LOW VIBRATIONS: Husqvarna’s anti vibration system efficiently separates your hands from the vibrations generated by the engine and the cutting equipment. This is to protect your body but also to reduce the fatigue in your arms and hands and in the end of the day contribute to make your workday more productive. SOFT CUT-OUT SYSTEM: The innovative system for engine control is designed for providing a long engine life. The system monitors the engine and assures that the engine always is protected from over-revving. RUBBER HANDLE INLAY FOR SAFER GRIP: The rubber handle provides a firm grip, while still allowing you flexibility while you work.